An INFJ who’s making sounds like “um-hum” while glancing away looking for an escape doesn’t agree with you. But if they’re making the same sound with eye-contact while leaning toward you and smiling, then you’re good. Probably. INFJs don’t usually lie to people. They might let you believe something that’s not quite true, but most of us won’t give you an enthusiastic, “Oh, yes” unless we really do agree with you. However, if pressured to agree with something we don’t want to say “yes” to but won’t openly disagree with, we might say something vague or push off a requested commitment to an unspecified future date. Open body language and leaning toward you means we’re really listening to you. We probably agree with you too, or at the very least understand and sympathize with where you’re coming from. Closed off body language, such as pulling away from you and making ourselves smaller, either means we’re agreeing reluctantly or that we’re scared to disagree with you. Neither’s good. To check if we actually agree, ask us. An INFJ who agrees with you will be able to explain why in specific terms. 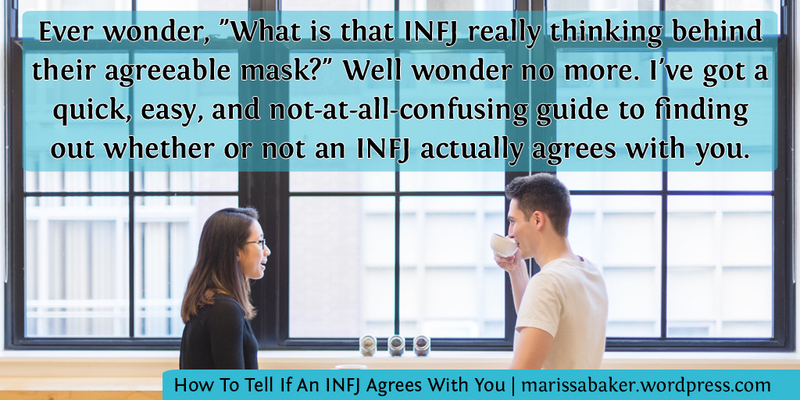 A vague INFJ either doesn’t really agree with you or they haven’t thought about it enough to give you a specific answer. It may take a few weeks for you (or them) to figure out which. An INFJ may show signs of agreeing with you when they really only mean they accept that you have a certain opinion on something. For example, an INFJ child who nods when their parents explain a rule and then still does their own thing (i.e. they accept that’s what the parent believes but still act by their own convictions). Eventually if you’re around an INFJ enough you’ll get a pretty good idea of what they actually do and don’t agree with from how they act. So there you have it. 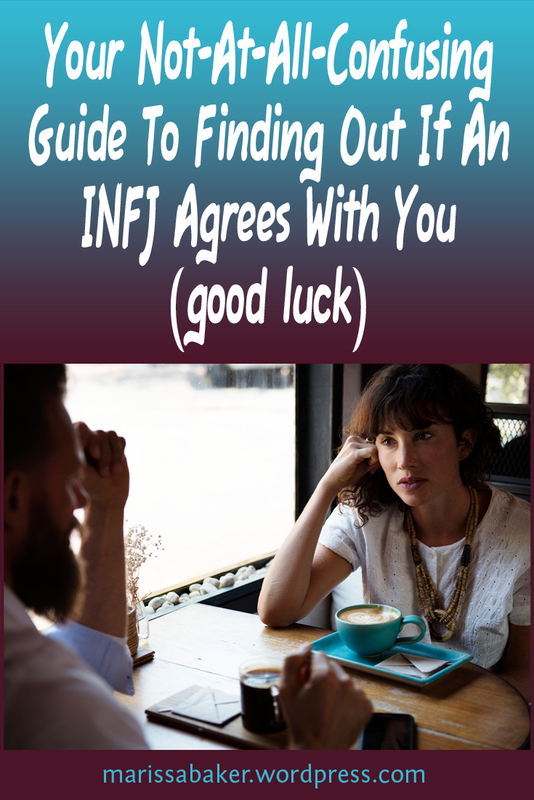 Everything you needed to know to figure out (or get even more confused about) whether or not an INFJ agrees with you. Good luck! ← What Does God Have To Say About Fear? Thanks for your comment Sarah! That’s an interesting question. I’m assuming you’re a writer, too? What do you write? I know intuition plays a huge role for me at least. I’m sure that’s what helps INFJs come up with so many unique ideas (though it’s probably also why it’s so hard to just sit down and finish a writing project!). And like with so many things, for my writings I find that I’ll often spend hours/days/weeks mulling over something off-and-on before I actually sit down and write (I think that’s my intuition working as a pattern-building process that’s constantly running in the background). One of an INFJ writer’s strengths, I think, is that we have that intuition to help us see different perspectives on an issue, then we can filter it through our extroverted feeling to present our ideas to the world in a way that other people find engaging. And I suppose that’s equally true for INFJs writing non-fiction and fiction. Pretty accurate, I have to say. On eye contact, though… I won’t make eye contact when I’m processing information or praying to react in a godly fashion. So, yay, more confusion.